The recent thaw has produced treacherous driving conditions as our roads have become littered with potholes appearing seemingly overnight. And with melting snow and rain, it’s sometimes difficult to detect potholes until your tires actually hit them. 1. Try to slow down before impacting deep ruts, releasing the brakes before you hit. This allows the wheel to roll through rather than lock up when it drops into the hole. 2. Be sure your tires are properly inflated and that your vehicle’s suspension parts are in good condition. They’re more likely to survive the impact if they’re up to the task. Worn shock absorbers provide little protection against an encounter with a rut or pothole. And when possible, report the location of dangerous potholes to your local municipality. 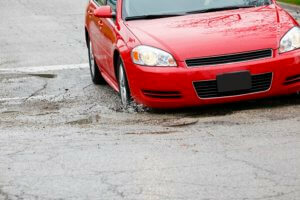 If you think your vehicle has sustained damage from hitting a pothole, don’t delay in getting it fixed. Give us a call now at 860-951-1083. Our skilled team of technicians are here to help get your vehicle repaired and back on the road.